Russian observers have hailed Vladimir Putin’s13th annual televised 'direct line' public phone-in as a success, despite the president struggling with questions about the government’s fiscal decisions over the last year. Economic issues were to the fore during the question-and-answer program, with interest in the Ukraine conflict apparently cooling. 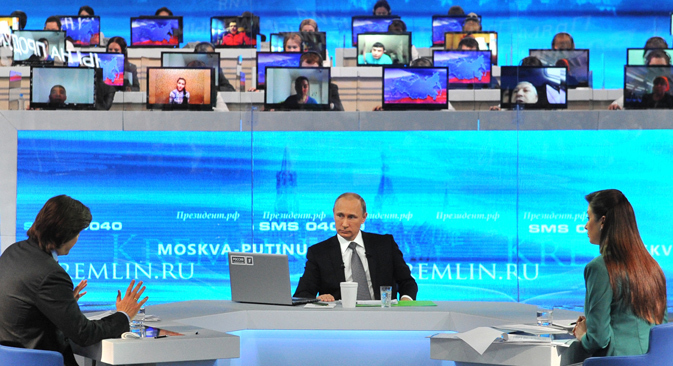 Questions about the economy dominated Russian President Vladimir Putin’s 13th annual live televised phone-in on April 16, with relations with Ukraine appearing to have taken a back seat. Putin spent more than four hours answering questions from the public on various issues in the annual broadcast, seen by many as a barometer of the public mood in Russia. As analysts explained to RBTH, there is a certain degree of fatigue over Ukraine, with public attention currently more occupied with the economic crisis at home. However, despite struggling with some challenging questions about the government’s economic decisions over the last year, observers saw the phone-in as a success, with the backdrop of a strengthening ruble and rising oil prices going some way toward allaying public fears. However, it was unlikely that the Ukrainian topic could have been avoided altogether. People are still concerned not only about the consequences of the conflict with Russia’s neighbor, but also about the possibility of its escalation. "I presume that this is impossible," said Putin on the question of the possibility of war. He also noted that it was not Russia's Ukrainian policy that had "failed," but Ukraine itself had "failed," by allowing nationalist forces to take advantage of its problems. The president stressed that while in his view Ukrainians and Russians were still "one nation," now Moscow expects nothing from Kiev but respect. The position that Russians and Ukrainians are a single nation “will have strategic consequences," said Sergei Markov, director of the Institute of Political Studies, which has close ties to the Kremlin. But in his view, the denial of any failures in Moscow’s Ukrainian policy did not satisfy those who "consider Ukraine a country de facto occupied by the Americans." According to Markov, this was the only area in which there was a sense of dissatisfaction among participants in the phone-in. "The theme of America was treated gently enough this time, even peacefully: Russia has no enemies except terrorism," said Konstantin Kalachyov, head of the Independent Expert Group. At the same time, independent political analyst Dmitry Oreshkin believes that the president’s description of the Ukrainian conflict as the "internal affairs of Ukraine" represent an attempt to absolve himself of responsibility for the events in the Donbass. Having expressed his frustration over Ukrainian President Petro Poroshenko’s alleged lack of interest in the region and noted that humanitarian aid would be supplied, Putin "effectively made it clear: 'No investment, sort it out yourself', "said Oreshkin. "This is a very bad signal for the Donbass." However, in contrast to the block of questions dealing with foreign policy, an area where the president feels freer and more competent, the economic questions put Putin in a rather uncomfortable position, said Alexei Mukhin, CEO of the Center for Political Information. Essentially, Putin "had to find justification for the actions of the government, which many consider to be insufficient, inert and tardy. And here he had a hard time," said the analyst. For example, "the president was stumped by a question about foreign currency mortgages." Nevertheless, Putin's answers are likely to have satisfied the Russian public. "He stressed that, despite the sanctions, we even have slight economic growth. Even though there is a drop in living standards, we will not allow it to be serious, and we will use sanctions in our own interest, and stimulate growth. This is the most important thing," said Markov. According to Konstantin Kalachyov, the fact that the general situation in the country has improved of late means that the population's fears have been put at rest – for now, at least.“In general, the degree of social well being has risen," he said. In his view, the lack of critical moments during the phone-in was predictable, since people would rather turn on the TV on this day to see that everything is going according to plan, there is stability in the country and the president is in control of everything. The other experts interviewed by RBTH were of a similar opinion. According to them, the 'direct line' was entirely predictable, dull in places, but in general, everything was as it should have been. "The head of the country is showing that he’s in good shape and is in possession of information. It is clear that everything was directed, and there are no complaints about how it was done. It would be strange if it were otherwise," said Dmitry Oreshkin.